Fleece available in 10 colors: black, olive green, pl woodland, coyote, camogrom, foliage green, flecktarn, jungle green, mp camo and shadow grey. 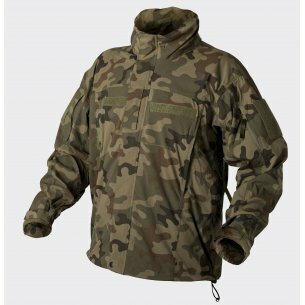 All fans of military outdoor clothing are invited to familiarize themselves with the Helikon Patriot fleece collection. We offer models in classic styles that stand out for their exceptional durability. Thanks to the additional functions of the fleece, they meet the expectations of the most demanding users. We provide a very wide range of colors, which further facilitates the adjustment of a specific product to individual preferences. We propose fleets designed to maintain freedom of movement and comfort, regardless of the intensity of physical exertion. No problem, you can adjust them to the figure, in which the adjustable sleeves with velcro closure will be helpful. The manufacturer also used a puller with a stopper, which is located at the bottom. Particularly noteworthy are ventilation inserts located in strategic places - armpits. Thanks to this Helikon Patriot men's fleece guarantees good air circulation during survival hiking or sports training. The comfort of wearing is influenced by the lightness of the fleece jacket - the clothes offered will certainly not be an additional burden on a walking expedition. It is worth emphasizing that it is clothing designed for the army and police, which significantly confirms its adaptation to physical activity. 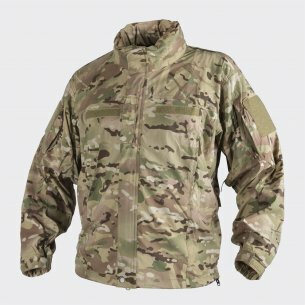 Our military store offers Helikon Patriot fleece with zipper, which are perfect as a practical jacket for spring or autumn. On warmer days the fleece can be worn in a duet with a regular t-shirt or thermoactive underwear. You can also successfully put it under a winter jacket or coat to additionally warm the body in winter weather. In order to protect against rainfall, it is worth paying attention to the practical hood. Helikon Tex fleece perfectly protects against rain and snow not only because of the appropriately contoured headgear, but also thanks to the small roof that gives the right form. Just like other clothes from the manufacturer, also fleece sweatshirts effectively protect against wind and help maintain optimal body temperature. An additional advantage is the rather high collar with the possibility of adjustment with the use of laces. Helikon men's fleece has been designed taking into account the most important features of the military style. Our offer includes sweatshirts in the most varied colors, whose common advantage is the possibility of obtaining effective camouflage. 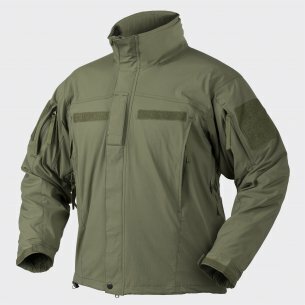 Certainly, many amateurs of military clothing will pay attention to the Helikon Patriot fleece in the olive green color, in graphite gray or in light brown. We also offer sweatshirts in universal colors, which will appeal not only to those interested in military style - in this respect, it is worth distinguishing even the model maintained in classic black. 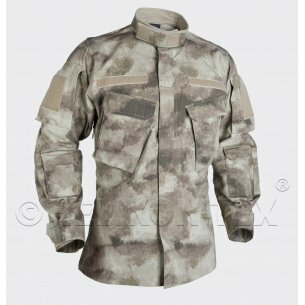 We meet the expectations of customers who are particularly interested in good camouflage in the field, as evidenced by the proposals in the camo style. Why the Helikon Patriot fleece is so practical? In Helikon Patriot fleece, the manufacturer has put on proven solutions that ensure full comfort of use. One of the key advantages are conveniently placed pockets. Each of them is zippered, so you can store even more valuable things without worry. Helikon men's fleece is the perfect proposition for survival lovers and long hikes - pockets can be arranged in any way, because they are a great alternative to additional compartments in a backpack or bag. Two of them are on the chest, two on the sleeves, one large on the back and an additional bottom on the left sleeve. A very practical solution is also the presence of pads in the form of a thicker layer of material on the elbows. Strengthening hems are also found on the shoulders, which further affects the strength of the sweatshirt. Helikon Tex Polar is a blouse that stands out not only in its functional qualities but also in its fashionable appearance. It can be successfully worn in combination with denim trousers or sports tracksuits, but at the same time it fits well with typically military trousers. All amateurs of comfortable clothing for active men are invited to familiarize themselves with our wide range of military fleets, which can not be denied the universal character.